At Active Pest Solutions we have 15 years’ experience and training in all aspects of flea control and removal. 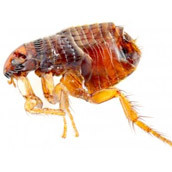 Our operatives are regularly asked to provide flea control in Fife, Perthshire and Kinross-shire, as fleas can be a problem in homes and commercial premises in these areas. The cat flea (Ctenocephalides felis) and dog flea (Ctenocephalides canis) belong to the order Siphonaptera, and each of these types of flea can cause considerable distress to householders and business owners. We are acutely aware that a sensitive and caring approach is required when dealing with flea infestations. Our specialist insect control technician has successfully resolved many flea infestations by means of thorough professional flea control methods. The fact that we use approved techniques ensures that your family, your pet, your home and furniture remain protected. As members of the Fife Trusted Trader scheme and Perth and Kinross Better Business Partnership, our working practices, pest control qualifications, customer service and integrity have been assessed and checked by trading standards officials, so when you contact Active Pest Solutions you know you’ll receive flea control that you can trust – at very competitive prices. Fleas can carry diseases and are known to transmit tapeworms to humans, particularly young children. However, by far the biggest concern is the irritating itchy bites they inflict on humans. Flea bites can become very swollen and inflamed, causing considerable discomfort to the victim. Cats and dogs can suffer similarly distressing effects from flea bites, and in their desperation to ease the irritation will scratch incessantly at the problem, causing further serious skin damage and hair loss. Find the source, e.g. cat, dog, etc. Treat the host animals. Vets will advise on appropriate products. Treat all affected areas in your home with appropriate insecticide – including human bedding and pet baskets, carpets, sofas and chairs. Professional pest control products are by far the best for this purpose. Washing bedding at a high temperature will also help to kill fleas. Vacuuming before and after treatment can help remove different stages of a flea infestation. Dispose of the hoover bag carefully or burn the contents, and be sure to disinfect bag-less appliances. 15 years of flea control experience. Regular flea control service visits to protect you, your family and your business. One-off flea control visits to businesses or homes. If you have a flea infestation in your premises, don’t wait till it drives you ‘hopping’ mad – call in the professionals straight away! Ring Active Pest Solutions on 01577 862035 and then you can relax while we get on with the important business of sorting out your flea problems.